If you are a privileged or privileged who can surf on the beautiful beaches of the Majorera island, we give congratulations, it’s definitely a paradise with warm weather and the best weather conditions to catch the perfect waves all year round. Your wetsuit to surf ¡Amazing! You must take into account how to take care of your neoprene suit, as it is very important to do it in the proper way to prolong its useful life, and to continue enjoying this wonderful sport to the fullest.The wear and tear from constant use, exposure to the sun, saltpeter and many times the cuts or scratches caused by corals or rocks from the seabed, can make your suit need some repairs. If your suit is new and has a manufacturing defect, you can take it to the shop for repair or replaced at no extra cost, if it is still within the warranty period. This period is usually a year after you bought it. If the suit is no longer covered by the manufacturer’s warranty or for damage caused by the use, you can take to repair or try to do home repairs. Some rips, cracks or small holes can easily be patched using special cement for neoprene suits. There are also practical repair kits such as Iron Mend, which are very effective for reinforcing patch damaged areas and are easy to use. To prolong the life of your suit it is essential to treat it with care, not to force the zippers and keep it always clean. If you let it dry with remnants of saltpeter, the neoprene will age quickly and cracks will appear, making it less resistant and lose flexibility. After each surf session you should wash it with cold fresh water and let it dry in the shade, so that UV rays do not harm. You can take it to the beach shower to remove salt water and let it dry upside down in a specific hanger for such suits. Once dried notes reverse side must flip for it to finish also dry on the outside. To save the suit you must choose a place with ventilation. If you leave it in the trunk of the car, you will be exposed to high temperatures and is likely to heat and moisture, take very smelly. 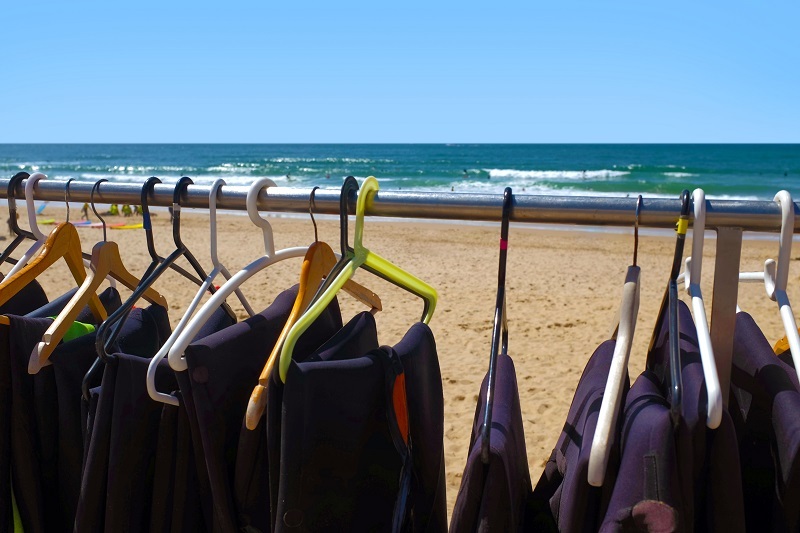 If you have a suit that smells bad, do not worry you can fix it by washing it with a special shampoo for wetsuits. You will find them in surf shops. Are products that remove dirt and simultaneously eliminate the bacteria causing odors, often caused by urinating in them or keep wet suits, without cleaning or rinse properly.